Andrew Ryan - I want a comedy night! Cork’s ANDREW RYAN’s quintessentially Irish storytelling abilities and cheeky, friendly demeanour make him a natural observational stand up. He has supported both Justin Moorhouse and Terry Alderton on their UK tours and his debut hour long show ‘Ryanopoly’ at the Edinburgh Fringe Festival in 2012, received rave reviews (‘Illuminating debut ★★★★’ Metro). Television includes ‘Russell Howard’s Good News‘ and he has appeared on Sky Sunrise and as a regular panelist on BBC Radio. 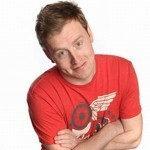 Andrew is the resident compere at our Didsbury Comedy Club show on the first Sunday of each month. Pop down and see what the fuss is about!